Contributions to Contemporary Neurology features articles presented at the scientific meeting at the March 1986 gala evening affair held in Cleveland, Ohio in honor of neurologist Joseph Michael Foley's seventieth birthday and his impending transition to Professor Emeritus at Case Western University. This book is organized into 20 chapters written by 41 contributors. It starts with the biography of Foley and ends with his curriculum vitae. In between the biographies and curriculum vitae are basic and clinical articles written by professionals closely associated with Foley throughout his illustrious career. 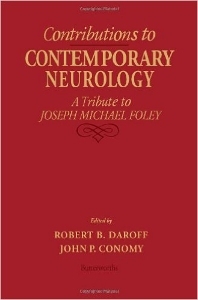 This book will be of interest to those interested in learning about the life and career of neurologist Joseph Michael Foley. 8 Differing Distribution of Men and Women in Transient Global and Transient Ischemic Attacks: Does Exogenous Estrogen Playa Role? 16 Is the Brain Dead? MD, Professor and Former Chair, Department of Neurology, Case Western Reserve, University School of Medicine, and University Hospitals Case Medical Center, Cleveland, Ohio.